Ruisrock 2007 The oldest annual Finnish rock festival Ruisrock started for the 38th time on Friday 6th July in Ruissalo, Turku. About 18000 people had come to enjoy a very good mixture of bands on the starting day. First really energetic gig was delivered by Lapko, a band that comes from a small Finnish town called Harjavalta. The vocalist Ville Malja is a master of rock star gestures and he knows how to flirt with the audience while handling the vocal and guitar duties. Lapko’s playing was in all ways very tight and you could easily see that the band is in good live shape. Lapko played most of the songs from their latest “Young Desire” album. People in Ruissalo seemed to know many of this booming band’s songs and especially the hit single “Killer Whales” made people bounce. Malja joked that the feeling is even better than the last day in school before the summer. Lapko has had some success also in Europe and will hopefully win more fans there on the following years. For me the best gig on Friday was definitely by a rising Finnish band Disco Ensemble. 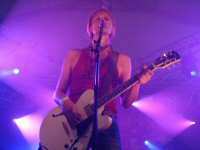 This band is also known in Europe and they’ve played many gigs for example in Germany. 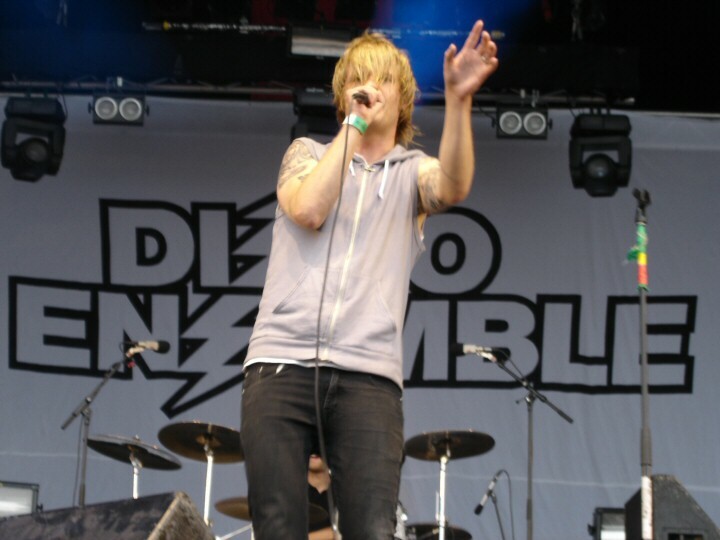 In Ruisrock Disco Ensemble offered all that you could expect from a good show. The were skilful and really seemed to enjoy what they are doing. I managed to talk for a few minutes with the vocalist Miikka Koivisto after the gig. – “We came straight from Czech Republic and we arrived here only one hour before the gig. I had quite surrealistic feelings during the first songs but after that everything went great.” For Miikka it’s always special to play in Finland – “Every gig is of course very important. But playing in your own home country is always special and a good feeling is very easy to reach” he said. Before Disco Ensemble Miikka visited rock festivals eagerly. 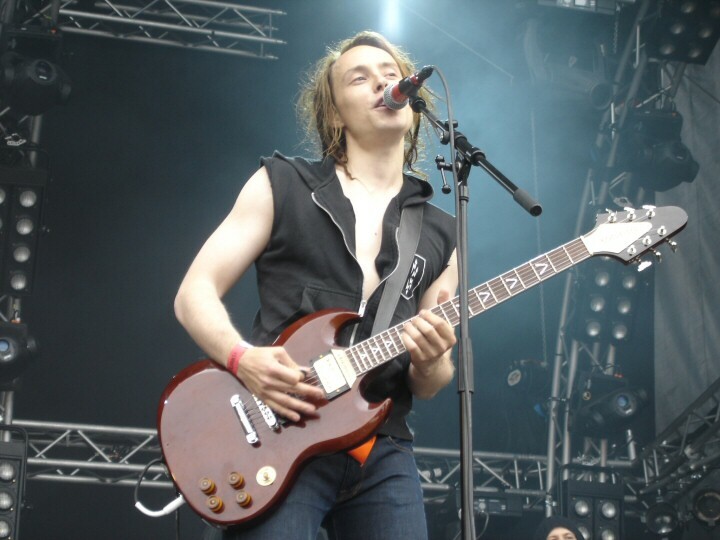 – “Provinssirock (in Seinäjoki, Finland) has always been the festival for me. As a teenager I was always very excited before every Provinssirock. We waited for the big bands to come and play and now we have chance to play in festivals like Provinssirock and Ruisrock with our own band. It’s great”. Disco Ensemble´s new album is in the making. – “It seems that new “diamond” will be released on the beginning of next year. Album will have the recognisable sound of Disco Ensemble but there will also be something “semi-shocking”, said Miikka with a mysterious smile on his face. Billy Talent´s racy gig was the last one on Friday. New songs from the latest “Billy Talent II”-album worked very nicely and suited Benjamin Kowalewicz’s original singing style well. The last song “Red flag” was very impressive and beautiful final for the first day of Ruisrock 2007. Swedish bands dominated Saturday. First on the afternoon Sahara Hotnights cascaded with the power of five women. The audience seemed to enjoy them and especially the hit song “Hot Night Crash” from the “Kiss & Tell”-album got a good response. The gig was a refreshing start for the fully booked Saturday. Ruisrock made a new audience record for one day with 30000 people. The Ark played their gig at 7 pm. and the festival people seemed to be on their best spirits just then. 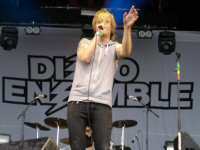 The Ark´s vocalist Ola Salo was once again the great “bandmaster” who knew how to make the audience kneel down. Especially the older songs got the crowd going but the songs from the new album “Prayer for the Weekend” weren’t so well known. For the metal music fans the special moment was the hour with In Flames. The band played hard and loud and devoted fans got what they were waiting for. The last band on that stage was indie-punk-band the Hives. For me the Hives didn’t work so well and I headed to see the legendary Hanoi Rocks, which played at the same time on another stage. I’ve seen Hanoi Rocks many times in Ruisrock but this gig wasn’t their best one. Still everything was quite ok and Mike Monroe was as energetic as ever. The new single “Fashion” (from the forthcoming album “Street Poetry”, will be released on September) sounded good live. Hanoi Rocks was once again the last band on Saturday in Ruisrock and many people had stayed until midnight to see their “local” hero. The last festival day, Sunday, was very rainy. Looks like the festival promoter Juhani Merimaa’s strategy is to save many interesting bands for Sunday and this year about 18000 people decided to come and skate in the mud while enjoying good music. 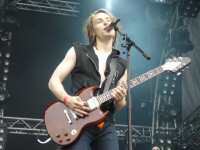 Sunday offered many great Finnish bands. Most of them sang in Finnish but one very skilful band, Von Herzen Brothers, has English lyrics. 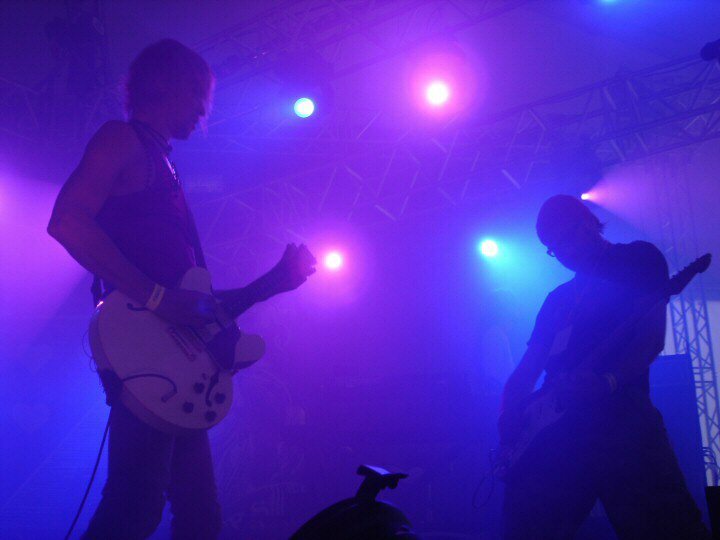 Many music professionals consider them as the best live music band in Finland right now. Their playing was really unbelievable and all of the instruments matched nicely together. Songs were also very melodic and not too progressive for my taste. 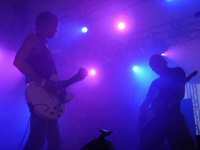 There are three brothers in the band but in Ruisrock they had also two extra players with them (drums and keyboards). After the gig I asked from the oldest brother Kie Von Herzen about his feelings. – “We were lucky to play inside the tent. Many people were there because of the rain”, he laughed. –“But I hope some of them had also come to see our gig.” Von Herzen Brothers hope to raise interest also in the international market. – “Out latest album “Approach” was released in Sweden, Norway, Denmark and Holland but it wasn’t promoted properly. It was a so called “soft release” and it wasn’t that successful. Of course it’s some kind of an aim to play abroad but you need luck and hard work to make it”, said Kie. Maybe the most awaited band on Sunday evening was legendary Roky Erickson & The Explosives. Almost sixty years old legend from Texas has very interesting and hard history. In 1972 Roky managed to get rid of drugs and after that he’s been more interested in demons and horror themes. In Ruisrock Roky performed his music very bloomingly and his set included his best known songs “Don´t Shake Me Lucifer” and “The Beast”. Ruisrock enticed 65000 people during three days and the festival succeeded very well this year. Despite of the unsteady weather people seemed to enjoy this traditional rock festival. Every year after the festival there’s a lot of speculation concerning the clean nature of Ruissalo which is distracted by the rock festival. 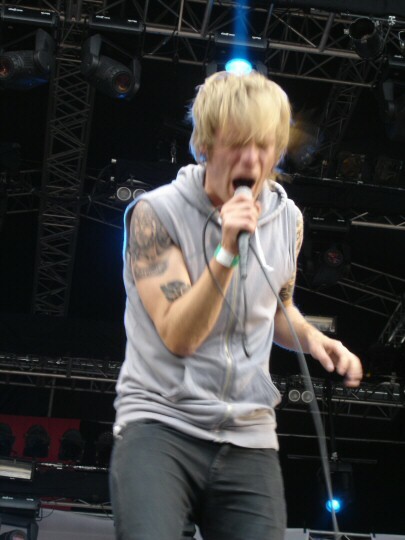 But I guess I’m not the only one who hopes that Ruisrock will be arranged in the same place again in 2008.